Christ the Tao: Sam Harris Saves the Atheist World from Sin. Sam Harris Saves the Atheist World from Sin. The first paragraph above is, I think, reasonable, and one should put one's best foot forward. Don't blame religious teachings for what they don't teach, blame them for the effect of what they do teach. OK, we can agree about that. Let's start with reason, before we leap head-first into incoherence and plunge into self-justifying delusions. 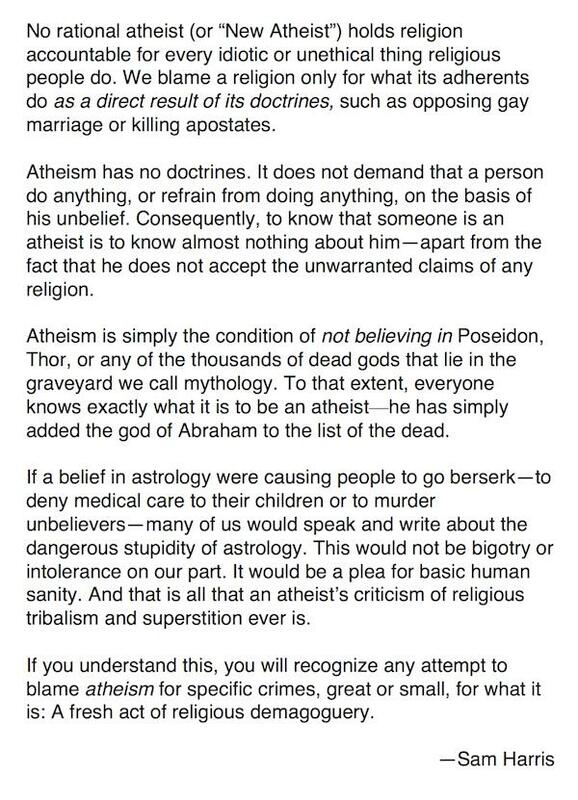 Harris begins the second paragraph by redefining atheism, as has become the fad of late. "Atheism has no doctrines." Well of course it does, "There is no God." Of course "it" cannot "demand" anything, because "it" is an abstract idea -- there is no God. But as Harris says elsewhere, "Ideas have consequences." There are many consequences to the idea that there is no God, miracles do not occur, we were produced by luck and evolution for no particular purpose. Of course what those consequences might be can be debated, as might be the consequences of, say, refusing to believe in evolution (another negative belief). While atheism does not "demand" anything, it "implies" a lot of things, linking doctrine (as it is always linked) to action. Atheists make this point themselves, over and over again -- what does Harris think to accomplish by trying to deny it? In the third paragraph, the nonsense grows serious. First of all, it is irrational to compare Thor and the Creator. Thor is a being with a red beard, who originated at some time in the past, who must be in one place at one time, and has limited abilities, superceded by other beings stronger than him. God is the origin of all things, with no beginning or end, Creator of the universe and all things, all-powerful, and knowing my own and Sam Harris' thoughts. The "god of Abraham" is not "a god," He is the only God -- the God worshipped around the world by hundreds of different names. To conflate two such different concepts -- even if you don't admit they correspond to realities -- shows fuzzy thinking. But the fuzziness has the happy consequences of furthering Harris' argument, and mocking genuine theism, besides. Harris think fuzzily, because clear thought would ruin his argument, and perhaps his life. Secondly, this new conceit that atheism does not mean denial that God exists, is generally belied by those experts in the English language who write our dictionaries. Notice, for instance, that while Oxford does admit the word can be used that way, that is not its first (therefore primary) definition of "Atheist:" "A person who believes that God does not exist." Otherwise, everyone who has never heard of God, would be an atheist. That's just not the way the word is used. If it were, however, one consequence would be that probably 90% of "atheists" in the modern world would have acquired their "atheism" from Marxist propaganda and squelching of "religion." Another would be that every baby in the crib, maybe everyone with advanced dementia, would become an unwitting atheist. In fact, every tree and every dog that surrounds it, could also be called "atheists." Finally, as for Harris' "fresh act of demogoguery," he should own it, because the demogoguery is his own, and no one else's. Why does Harris comparing "atheism" to "religion?" What should be compared is "atheism" to "theism." Both creeds have consequences, obviously. Even if atheism were merely "lack of belief in God," despite Oxford and thousands of years of usage, that would not absolve it from causation. If I lack belief in gravity, that will have consequences, especially if I am a tight-rope artist or an airplane pilot. If I lack believe in wives, that will also have consequences. But defining atheism the way Harris and others do, is meant to have consequences, especially this one: to allow atheists to blame "religion" for evil, while absolving themselves from any blame for evil done by their fellow atheists. "We atheists are simply pleaing for human sanity and an end to religious madness!" Yeah, right. So every time an atheist is a jerk, having denied the Judge of Jerks His lawful jurisdiction, effect can never be traced to that cause. When Sam Harris' fellow atheists set up Gulags and crammed believers and other people by the tens of thousands, that didn't count either, because barbed wire does not follow necessarily from mere "lack of belief in one more god." In fact, whatever an atheist does, can never count against atheism. Sam Harris has applied his magic wand, and made all atheist guilt go away. And that, without dying on a cross. Of course, that means that atheism can never do any good, either. When a gambler admits that breaking even is his goal, you know he recognizes that he's well in the hole, at present. Those horrible monsters you mentioned in your entry here, they were Marxists-Leninists, and Marxism-Leninism is a LOT more than atheism. A LOT more. Persecution of religion one might reasonably ascribe to atheism -- if religion is a Bad Thing, then it should be suppressed. But most of the other Bad Things that M-L'ists have done cannot reasonably be ascribed to atheism. I will concede that it's not enough to be an atheist. Because one can be an atheist and also believe in quasi-religious belief systems like M-L and Ayn-Randism. Loren: I think your response is quite reasonable and temperate, given that my own post in this case was perhaps more strongly worded and critical than it needed to be. Yes, M-L is much more than atheism, as Medieval or Renaissance Catholicism was much more than theism. Still, folks like Dawkins blame "religion" for the Inquisitors. If you read Aikman's Atheism in the Marxist Tradition, or even my Jesus and the Religions of Man, I think you'll understand the basis for my opinion that atheism was, in fact, deeply important in forming the attitudes towards morality, violence, and rule that eventuated in communist history, for better and for worse.